Many colleges are using the Raspberry Pi for computer science educationnal purposes due to its low price and accessibility. That is why Linutop has developped an operating system designed especially to help setting-up a digital signage system with a Raspberry Pi. Allowing you to convert any Raspberry Pi at your disposal into a powerful digital signage device. Dynamic display allows professionals with the help of Linutop mini-PCs or Raspberry Pis to communicate faster. The system can operate 24/7 and is specially designed to be a low power system. The configuration is very simple and these fanless micro-computers operate silently. Linutop mini-computers are ideal tools for displaying photos, HD videos, PDF files and everything related to school and after school. As a digital display medium, they have several features. For example, it is possible to set the duration of each element to be displayed. Linutop mini PCs have other advantages. Since they are fanless, they consume very few energy. Indeed, Linutop micro-computers have an energy requirement 10 times lower than ordinary PCs. The Linutop digital signage solution is an ideal choice for colleges who intend to broadcast every day. 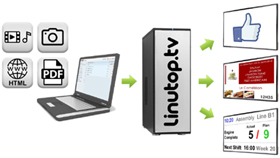 They can also turn into Internet kiosks within few clicks thanks to the Linutop Kiosk software included in Linutop OS. Ideal for colleges leaving Internet terminals available to their students 24/7!